I had conversation with my sister before about the things that she wanted to eat, things that not common in Malaysia and pretty hard to get our hands on - fennel (the bulb), radish (the European radishes - Raphanus sativus), rhubarb, and many more. I was not that interested before, not until I have seen them fresh and aplenty at the Wageningen market. I'm curios how these common temperate climate vegetables/fruits taste like. Asking my hubby who is not into culinary doesn't help either even though he grew up eating them. So each week I'm planning to buy these 'uncommon' (uncommon for me who grew up in a tropical country that is) vegetables/fruits and experimenting them at our kitchen. There were many rhubarbs at the market today, which were sold pretty cheap. Looking at them reminds me of celery, but they are from different family. 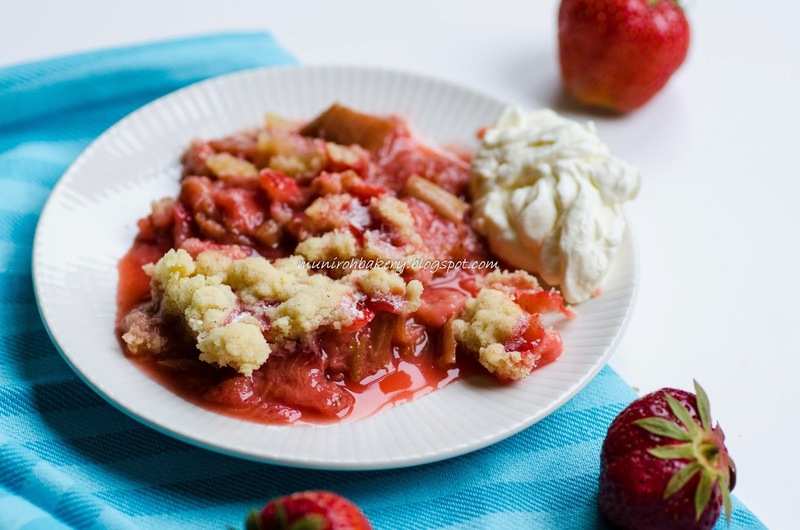 My hubby warned me the sour taste of rhubarb, and I told him I'm going to make pie out of it mix with strawberries. He was keen with the idea, as long he is not helping me out with making the pie (geez thanks). I had not prepared my favorite pie dough beforehand (which you guys can get the recipe from Majalah Rasa July issue which I had written), so making crumble pie is the next best thing (or even better). 1. Place the rhubarb, lemon juice and sugar in a deep dish (I used square 8' x 8') and cover the dish with foil and bake at 180 °C until the rhubarb is tender. 2. While waiting prepare the topping - mix everything in a large bowl (or you can use food processor) and mix until the dough becomes sandy (or crumbly). Place the dough in the fridge while waiting for the rhubarb to cook. 3. 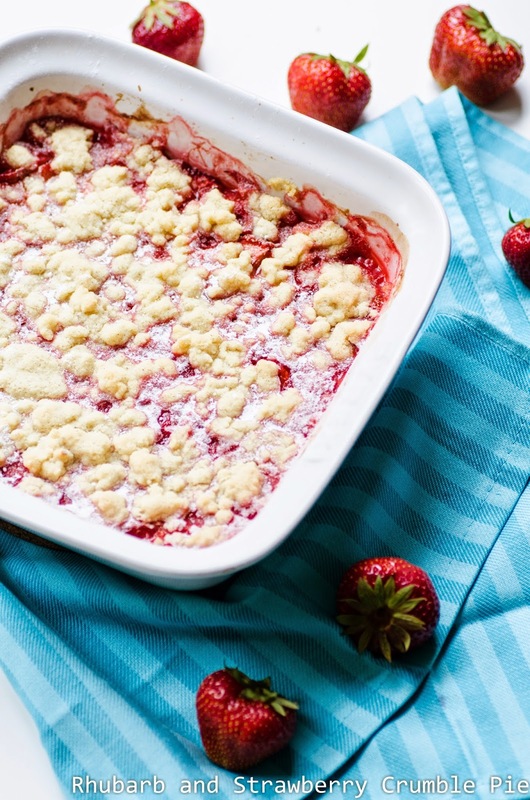 After the rhubarb becomes tender, mix with strawberries and corn flour and cover the filling with the topping and bake for 30 - 40 minutes or until the crust becomes golden brown. Serve with powdered sugar and whipped cream. As for the experience goes, the pie was good, but I had to put lots of powdered sugar to complement with the sour taste haha. I should have put more sugar in the pie, but then again I like the fact that I can control the sweetness by using the powdered sugar. As for my hubby, he said he likes it and can't imagine he would have eaten rhubarb again after all this year. Hey.. are u residing in Holland now ? I just bought rhubarb thinking to make the same thing too! Hey Swee San, yup currently in Netherlands till 2018 ;) Where did you buy rhubarb in Malaysia? Jaya Grocer? Publika?